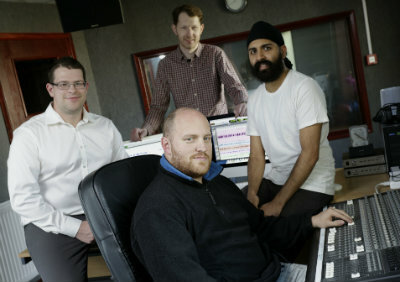 White House Sound is one of the leading independent audio book recording studios in the UK, based in Leicestershire. Founded in it's current location in 1990 with one studio for music recording, before diversifying into audio book recording in 1995, WHS has gone from strength to strength since then expanding into 4 bespoke studios and post production facilities. To find out more about White House Sound please click on the links below. A leading entrepreneur in Leicestershire, Mike Hester (stage name Mike Miller) was at the forefront of music and speech recording, leading the field in the adaptation and development of audio technology. His journey to becoming the Owner and Managing Director of Leicester's premier recording studio, WHITE HOUSE SOUND, began back in 1945, when at the age of six he taught himself to play the ukulele and then quickly advanced to both four and six string guitars. At the tender age of eleven he converted his own acoustic guitar to electric guitar and later built his very first guitar amplifier. A career in music became inevitable and during the early fifties Mike played in and managed many professional bands and groups, eventually becoming the Musical Director of his own Band. He then became involved in broadcasting and recording for prestigious organisations such as the BBC and Phillips. Mike's early recording studios were always based in Leicestershire and the move to the current location in Syston in 1990 began the latest and most exciting stage of Mike's career. Initially continuing with music recording, he quickly pursued the opportunity to diversify into a very different market. Thus, the first experience of recording speech for corporate ventures began. Mike co-owned WHITE HOUSE SOUND Ltd., with his wife Kay. From the outset, Kay has contributed significantly to the success of the company, with her flair for design and her understanding of the necessity to provide a top quality working environment to attract premier clients. It was in 1995 that the opportunity came about for Mike & Kay to begin recording audio books for an established publishing company. What began with a few ad hoc orders, quickly flourished into a burgeoning business and industry leaders quickly learnt that their sometimes inferior products could be sent to Mike for the White House 'treatment'; to be skilfully edited and for the sound quality to be enhanced using the latest technology available. Since 2010 the company has been operated on a day to day basis by Mark Anderson – Kay’s son and Mike’s step son - with the same values and striving for the same quality as under Mike’s management. Unfortunately Mike sadly passed away in 2013 but his legacy lives on. The Hester/Anderson family are now the proud owners of one of the few independent studios in the country, specialising in speech recording, which has an enviable reputation within the sound recording industry. The company is now going from strength to strength under Mark’s management with constant development in technology and the continued striving for exceptional output through the highest possible production and post-production values. White House Sound was established in 1990 to provide recorded speech for corporate ventures to the audio book industry. We are based in Syston, Leicestershire. This policy is posted on the Company Notice Board.